Gary Mayer, PhD, associate professor of computer science, discussed robotics and, along with members of the Autonomous Robotics Club (ARC), provided robotics demonstrations during the morning. STEM Resource Center Manager Colin Wilson gave Star Lab science demonstrations during the afternoon. Worden fifth grade teacher Tonya Gurley said the students were excited to see various robot demonstrations. “They loved the opportunity to test the robots’ abilities,” Gurley said. “A huge favorite was Puppy-bot, which could roll over, do a handstand, or dance upon hearing a specific number of hand claps. Students learned that robots sense, think and move. “They were impressed with the robots’ abilities to help people and complete dangerous tasks. 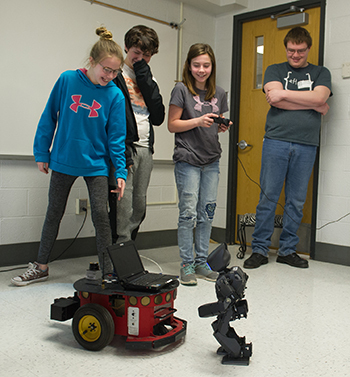 Gary Mayer and his robotics team inspired students to make their own robots and possibly pursue degrees in computer science and engineering.”Along with Puppy-bot, students were visited by Darwin, a bipedal robot who plays soccer. They also interacted with Taz, a navigation robot capable of mapping a new environment and traversing it when given goals. Photo: SIUE student presenter Zachary Anderson looks on as Worden Elementary students interact with Taz, a navigation robot. 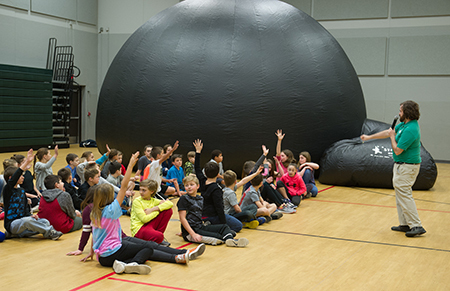 SIUE STEM Resource Manager Colin Wilson engages with fifth grade students from Worden Elementary during the School’s Space Day.